Ipl 2019 Match Schedule Time Table. Ipl 2019 Match Schedule. Ipl 2019 ka Time Table. 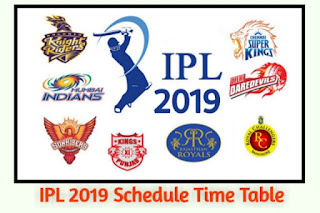 दोस्तों IPL 2019 Full Schedule Time Table आ गया है. आज में आपको इस पोस्ट में IPL Season 12 Schedule – Complete Details for Indian Premier League 2019 Dates, Time, Matches, Teams, Date Sheets के बारे में पूरी जानकारी देने वाला हु. जो लोग Cricket देखने में इंटरेस्ट रखते है उनके लिए ये पोस्ट बोहोत ही जरुरी है. इस बार IPL 2019 Season 12 के Teams के नाम ये है :- Chennai Super Kings (CSK), Mumbai Indians (MI), Royal Challengers Bangalore (RCB), Kolkata Knight Riders (KKR), Sun Risers Hyderabad (SRH), Delhi Capitals (DC) Kings XI Punjab (KXIP), Rajasthan Royals (RR). तो अब हम IPL 2019 Time Table Match List देखते है. 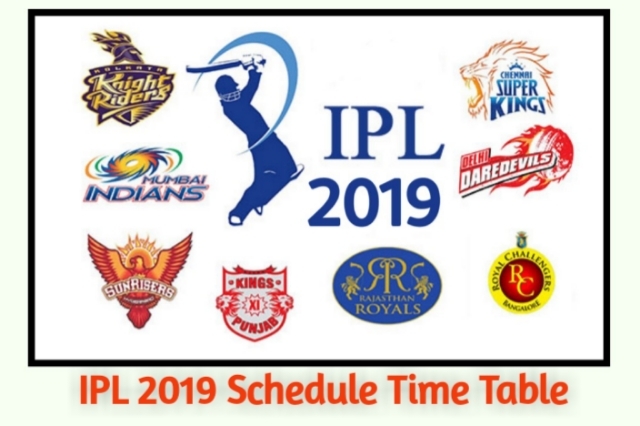 दोस्तों मुझे आशा है की आपको IPL 2019 Schedule Time Table अच्छा लगा होगा. आप इस पोस्ट को आगे share जरुर करे ताकि IPL Cricket Lovers को ये जानकारी मिले.